Everyone’s going bananas for this BEST offer we’ve seen to date to easily and quickly earn a Southwest Companion Pass, which lets one person fly FREE with you for the life of the pass. –> This is the last week for the offer, which ENDS Monday, February 11, 2019! All you have to do is sign up for one personal Southwest card, meet a $4,000 minimum spend and you’ll have a Companion Pass good through 2019 plus 30,000 Southwest points to spend on FREE flights. You will need to pay the mandatory security fees ($5.60 per way within the U.S.) for you and your Companion. Note: Those who have earned a promotional bonus by signing up for ANY Southwest personal card in the last 24 months will not be eligible. And if you currently hold a Southwest personal card, you’ll need to close it before opening a new one, as you can now only hold one personal Southwest credit card at a time. Here are the full details on the AMAZING Southwest Companion Pass offer. But here’s ONE thing SO many people are missing about this offer that YOU NEED TO KNOW! A lot of people are grumbling that well, this deal only gets you a pass that is good through 2019. That is true … sort of… keep reading :). And normally, if you fulfill the regular requirements to earn a Southwest Companion Pass, which includes earning 110,000 qualifying points in ONE calendar year, you get a pass good through the end of the FOLLOWING year. PLUS, the 30,000 points they give you as a bonus for meeting the $4,000 minimum spend COUNT toward this 110,000 points! You can take advantage of this offer, earn your Southwest Companion Pass good through 2019 AND THEN, keep earning another 76,000 points (110,000 – 30,000 bonus points – 4,000 points earned for meeting the minimum spend) by Dec. 31, 2019 and extend your pass so you can use it to bring someone with you FREE through the END of 2020. Win, win!! My online course gives you the FULL scoop and walks you through a variety of roadmaps that will get you there step by step if you want some hand-holding, complete with Case Studies of how others have done it, and ALL the different ways you can earn Southwest points, including the easiest and quickest. 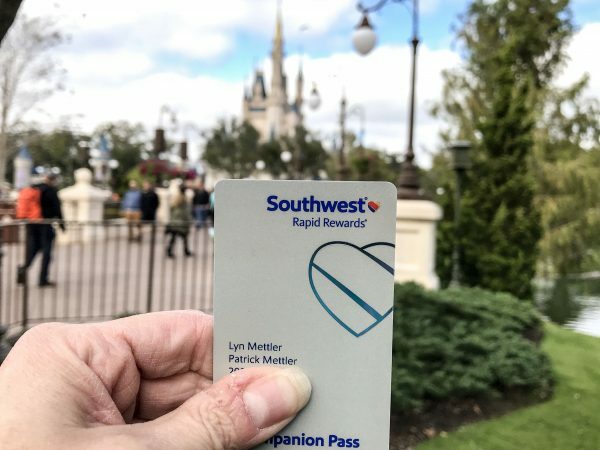 Refer friends and family to the card using your unique referral link (here’s how to find it) and get 10,000 points per referral up to 50,000 points across all Southwest cards. Sign up for the business card and earn 60,000 points after a $4,000 minimum spend (you can qualify if you earn any type of side income, even babysitting or dogwalking or selling things on eBay or Craigslist!). 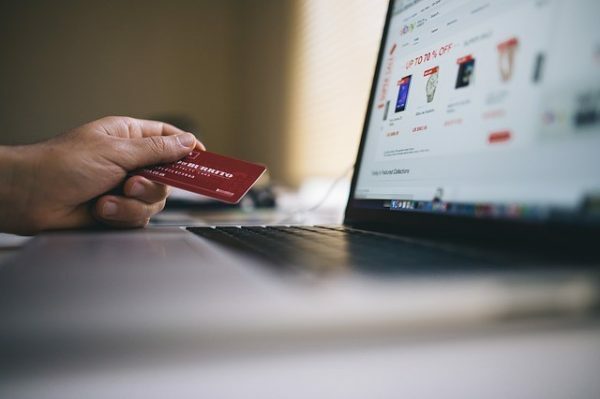 Rapid Rewards Shopping – Start ALL your online shopping at the Rapid Rewards Shopping Portal and earn up to 20 points per dollar on things you’d already be buying. You can even order your groceries online through the portal and then go pick them up in store! Earn thousands of points on cheap subscriptions – Each week, we share with you the BEST deals to earn Southwest points through the portal, like 1,100 points with a $12 subscription to The Economist and sometimes 1,400 points for a $1 Wall Street Journal subscription! Book a hotel through SouthwestHotels.com and earn up to 10,000 points per night! Pay for a Southwest fare, and earn 6 points per dollar on Wanna Get Away fares. These are just some ideas to get you started, but every year I have SO many readers earn the full 110,000 points to get their FULL Companion Pass, so I know you can do it, too! 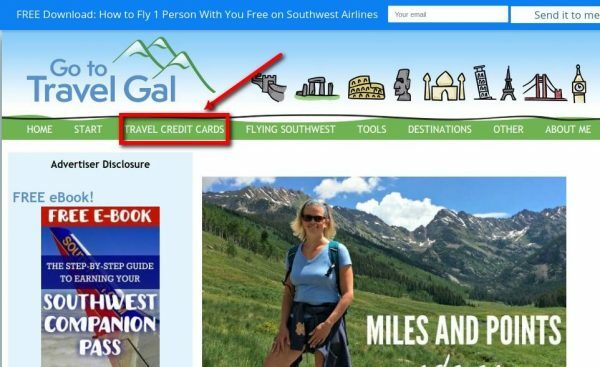 Thanks for using the TRAVEL CREDIT CARDS link in the main menu of GotoTravelGal.com (shown below) for any of your card applications. This helps support the blog and you get the SAME AWESOME OFFER. Thank you so much! Got questions? I’ll be joining the Cheap Southwest Fares Facebook group LIVE on video on Friday, February 8, at 1 p.m. ET, 10 a.m. Pacific to take any final questions before the offer goes away on Monday, February 11! I just found your site and see that this offer has passed . Will it ever be offered again? Hi Sylvia, unfortunately, there’s no way to know ;-). I hope so!